EFFECT OF THE PELVIC COMPRESSION BELT ON THE HIP EXTENSOR ACTIVATION PATTERNS OF SACROILIAC JOINT PAIN PATIENTS DURING ONE-LEG STANDING: A PILOT STUDY. Jung HS, Jeon HS, Oh DW, Kwon OY. Man Ther. 2013; 18(2):143-148. Abstracted by Pedro Castex, PT, COMT from Santiago, Chile, IAOM-US Fellowship Student & Jean-Michel Brismée, PT, ScD Fellowship Director. The objective of this pilot study was to compare the effects of the pelvic compression belt on hip extensor muscle activation patterns during one-leg standing in subjects with and without SIJ pain. EMG activation patterns of hip extensor muscles during one-leg standing were measured in thirty-one women (16 subjects with SIJ pain and 15 asymptomatic subjects). Measurements were performed both without any compressive device and wearing a pelvic compression belt. The results of this study showed significantly greater EMG amplitude of biceps femoris in SIJ pain group subjects compared to participants in the asymptomatic group. However, a reduction of EMG amplitude of the biceps femoris and an increase of EMG amplitude of the gluteus maximus was observed within each group when the pelvic compression belt was worn. There was also a significant reduction in the premotor reaction time (defined as the time between an auditory stimulus just prior to adopting one-leg standing position and the onset of EMG activity) of the gluteus maximus using the pelvic compression belt in the subjects with SIJ pain only. Consistently, premotor biceps femoris reaction time was significantly greater with use of the pelvic compression belt in the SIJ pain group only. During one-leg standing, the pelvis of the supporting leg has the tendency to rotate anteriorly because of a forward torque generated by the contraction of the hip flexors of the contralateral side. This should be controlled by the proper activation of hip extensors.5 In this regard, Hungerford reported that the pelvis on the side of the supporting limb rotates slightly posterior in subjects without SIJ pain. This supports the concept that posterior pelvic rotation induces SIJ nutation,5 which is considered the most stable position for this joint. In contrast, patients with SIJ pain showed slight forward position of the pelvis of the supporting limb,5 thus creating a relative counternutation position, considered unstable. This motor control deterioration may be explained by improper coordination of hip extensors revealed in the reviewed study. Indeed, it is hypothesized that increased premotor reaction time and increased EMG activation of the biceps femoris decreases capacity of gluteus maximus to activate properly during functional activities.2 A pelvic compression belt seems to increase gluteus maximus activation; possible mechanisms for this improved contraction could be related to increased SIJ stability due to mechanical compression, reduction of SIJ ligament tension (which in turn may reduce neurological inhibition of the gluteus maximus), and increased proprioceptive feedback. Based on this information, a pelvic compression belt may improve form and force closure mechanisms involved in sacroiliac joint stability. This could be useful not only when suspecting local SIJ involvement, but also when SIJ /pelvic instability contributes to the manifestation of symptoms in patients with other lower quarter problems, for example, as a result of kinetic chain imbalance. Patient lies supine.Therapist may place a pillow under knees to induce SIJ neutral position.Optionally, belt may be placed in standing position. 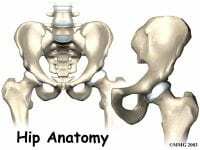 Belt is positioned around the pelvic area under the level of the Anterior Superior Iliac Spines (ASIS). Belt should not be worn distal to the greater trochanter level. SIJ provocation and Active Straight Leg Raise may be tested before and after placement of the belt in order to assess response to belt placement. Snijders CJ, Ribbers MTLM, De Bakker HV, Stoeckart R, Stam HJ. EMG recordings of abdominal and back muscles in various standing postures: validation of a biomechanical model on sacroiliac joint stability. Journal of Electromyography and Kinesiology.1998;8(4). Vleeming A, Buyruk HM, Stoeckart R, Karamursel S, Snijders CJ. An integrated therapy: a study of the biomechanical effect of pelvic belts. American Journal of Obstetrics and Gynecology. 1992;166(4). Hungerford BA, Gilleard W, Lee D. Altered patterns of pelvic bone motion determined in subjects with posterior pelvic pain using skin markers. Clinical Biomechanics. 2004;19(5).